Camping des Deux Rivières si trova a Millau, Aveyron, è situato fiume/torrente. Questo campeggio dispone di piazzole delimitate, sia ombreggiate che e piazzole poco ombreggiate. È possibile affittare casemobili. Il campeggio dispone di un parco giochi. Per gli sportivi, il campeggio prevede diversi percorsi in bicicletta. Nelle immediate vicinanze potete fare il bagno nel fiume/torrente. Al campeggio Camping des Deux Rivières è possibile praticare canyoning/canoa/rafting. Ogni anno un ispettore visita il Camping des Deux Rivières, controllando oltre 200 tra attrezzature e altri punti di interesse del campeggio. L'ispettore è un dipendente ACSI e non lavora per il campeggio. Owners are pleasant and efficient. Campsite is nicely maintained and pitches are generous. Bathroom facilities were nice. Breakfast options in the morning were fantastic! The campsite is tidy and ideally situated on the River Tarn. The owner was magnificent, on our departure day, we found we had electrical problem, no lights to the Caravan. He not only helped us diagnose the problem, he was able to fashion a repair that enabled us to continue our Holiday for which we thank him very much. This is one of many sites in the same area of Millau but we chose it as it was nearest to the bridge that leads to the town and we had also been here before, many years ago, and we wanted to see how things had changed. We arrived at 4.00pm to find the reception, bar and snack bar closed but with a notice advising arrivals to find a pitch and book in when reception opened at 5.00pm, which we did. Pitches were a good size and separated by low hedges, with plenty of tree cover for shade. We were in the second row from the river but had a view of it through the opposite pitches. The facilities were good with plenty of hot water. Reception, when it opened was friendly and efficient. Bread could be ordered for collection the next morning. There was direct access to a small pebble beach with a few loungers beside the river and it was pleasant way to while away a warm hour or two. There was a bar and snack bar onsite with limited opening but this wasn't a problem as there is a restaurant across the road as well as the plentiful offers in the town. The town is an easy walk. Easy access to the Gorges du Tarn which are well worth a visit. A good campsite for a couple of days or even longer visit to the area, with stunning views to and from the bridge. Pitches are level and good size. We pitched by the river. Easy walk across the bridge into town. Go up the bell tower, great view. Toilet arrangements were a little weird mixing men , women and washing up all together. Wifi was a bit rubbish. Great price! We often stop here for a few days and find it ideal for visits to the town and for cycle rides in the surrounding countryside. The pitches are of an adequate size and the staff are friendly. Riverside pitches are pleasant but can be noisy as they are nearest to the road, Would recommend it . Spent three nights here to visit the viaduct. Very good site within walking distance of town.Plenty of pitches bordering the river, but they were all taken. Overall the site was clean, tidy and pitches were level. Toilet facilities were mixed and were very clean, but strange to have washing up sinks inside the shower block. Tourist Office very helpful and spoke very good English. As others have said this campsite is close to the road and can be noisy. It is often the way with campsites close to large towns and to be expected as the trade is a short walk to the town. Well worth a visit and an English walking guide available from the Tourist Office. There was a 100 kilometre run (that is right 60 miles) the day we arrived so the campsite was busy. The facilities however were clean and sufficient. The staff were pleasant and helpful. The campsite does not have a swimming pool, but it's own beach by the river with sun beds. All round a very good value for money campsite. We used the site to visit Millau Viaduct and Roquefort for which it was perfect. We used none of the facilities as we have all on board our caravan.Water pressure was poor to refill our Aquarolls and the points were fitted with push taps which turned off automatically, this was frustrating if you needed water for a shower. The people were nice and spoke enough English to be understood. This site is close to the town and shopping facilities. Pitches vary from pleasant by the river to dusty and cramped, all with ample shade. Toilet/shower facilities mixed but were reasonable. The site however is subject to traffic noise and so if in the area again would probably look for a quieter site. Volete prenotare il Camping des Deux Rivières o oppure saperne di più? Potete farlo usando i seguenti dati. A75 verso sud, uscita 45 Millau. A75 verso nord uscita 47 (no pedaggio) La Cavalerie-Millau o a pedaggio sul Viaduc de Millau, uscita 45. A Millau seguire 'Campings' fino a ponte di Cureplat, oltrepassarlo, primo camping a sinistra. 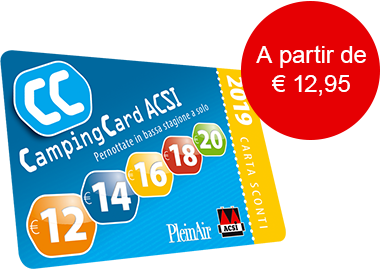 ACSI Eurocampings invia la tua richiesta di informazioni al "Camping des Deux Rivières".